Melfann's domain: Bliss Out = Yoga + Live Music = Love! I'm quite excited to attend Bliss Out which is happening on Sat, 12 Dec! It's going to be Singapore's first mega event combining yoga and music at the wonderful venue of The Meadow, Gardens by The Bay! I love listening to live performances and if you've been following me you know how yoga has impacted my life in a positive sense so although I'm not as crazy as some of my friends are, I really do enjoy yoga a lot! So...when I heard about Bliss Out and how it has both yoga and a mega concert...my reaction was "where do I sign up?". The evening will kick off with 2 yoga sessions by renowned festival instructor Sianna Sherman and Official Yoga Studio-Space & Light Yoga. After the yoga sessions will be the PARTY! It'll be interesting to watch this indie Kiwi electronic band, The Naked And Famous, perform live and of course, I'll be there to support local artiste INCH Chua! But here's the good news. You, my dear faithful readers, can get 10% discount by using my promo code BLISSOUTBLMELISSA! 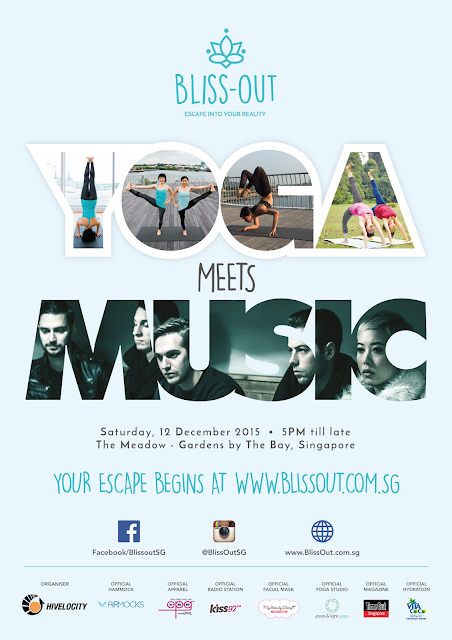 To register, visit www.blissout.com.sg and again, don't forget to use my promo code before 12 Dec to get your discount!